Minimum order is 25 coolies. Pricing as low as $1.49 each. 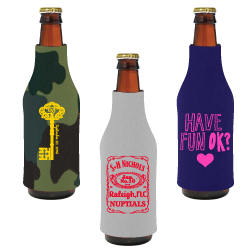 These impressive neoprene zipper bottle koozies have a zigzag finished seam and easy pull zipper tab. With so many material color options you are sure to find that color combo to highlight your celebration extravaganza. Our High-Quality Neoprene in 3mm of wetsuit material is constructed with a durable zipper & glued-in bottom. 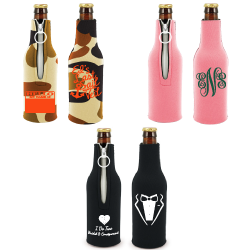 A perfect choice to dress your long necked bottle and also commemorate your event. Our High-Quality Neoprene (wetsuit material) is made with a durable zipper & glued-in bottom. Location(s): Prices include a one-color imprint on one side only. Your choice of side.